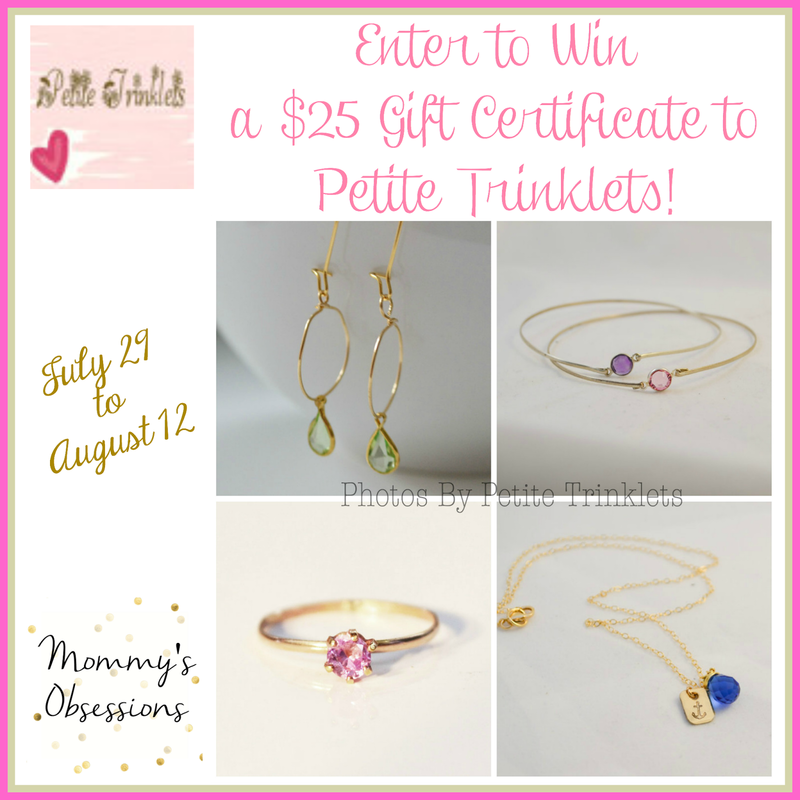 Welcome to the Petite Trinklets $25 Gift Certificate Giveaway! Jewelry! I love jewelry, i don’t wear it often, but i love to have a wide variety to choose from when I do. These are just beautiful. Mommy’s Obsessions has teamed up with Petite Trinklets to bring you a fantastic giveaway for the chance to spoil yourself with some new gorgeous, handmade jewelry! Petite Trinklets is owned and operated by jewelry maker Anita, who originally started her business journey with the shop Anci Decor. As Anci Decor flourished, she decided to take her business to the next level by creating her newest line, Petite Trinklets. Petite Trinklets features gorgeous, handmade jewelry that is simple, yet classy and timeless. Being a mom is one of the hardest jobs in the world, and we deserve to spoil ourselves sometimes too! Petite Trinklets makes gorgeous handmade jewelry that can be worn for every occasion, whether you’re just running out to the grocery store, or if you’re headed for a night on the town with your spouse. If you’re not a jewelry person, that’s okay too! Petite Trinklets jewelry makes for a wonderful gift for a loved one! They even make wedding party jewelry too! To see the full review of this gorgeous custom necklace, use this link! To Purchase: Visit Petite Trinklets on Etsy and chose the piece of jewelry that fits your personality the best! To Win: Mommy’s Obsessions & Petite Trinklets want to give one lucky reader a $25 Gift Certificate! The Giveaway will close late on the evening of August 12th. The winner will be chosen at random through Giveaway Tools. The winner will be announced both on Giveaway Tools form as well as notified by email and announced on Mommy’s Obsessions Facebook. The winner will then have 48 hours to claim their prize otherwise they will forfeit said prize and a new winner will be chosen. The winner will have their prize sent to them by Petite Trinklets, Mommy’s Obsessions and other participating bloggers are not responsible for prize shipment. Must be 18 years and older. Facebook, Twitter, Pinterest, and Google are in no way affiliated with this giveaway. No Purchase Necessary. Void where prohibited by law. US Only. Please direct questions, comments, and concerns to Mommy’s Obsessions. Mommy’s Obsessions has been provided with product to review by Petite Trinklets but has not been monetarily compensated for this giveaway. This disclosure is done in accordance with the Federal Trade Commission 10 CFR, Part 255 Guides Concerning the use of Endorsements and Testimonials in Advertising. I like the Teardrop earrings/ teardrop dangle earrings with sterling silver.